Registration at Deerfoot is handled through an online program called CampMinder. On CampMinder, you have a personal page for all your own information called your “CampInTouch” page. This is where you will register. For details on how to use CampMinder for Registration, watch the video below, which provides a detailed walk-through of Deerfoot’s registration system. Registration Phase 1 is for returning campers, those who have been on the wait-list for at least two seasons, or those who are siblings of returning campers. Phase 1 began on December 1, 2018 at 7:00AM (EST). Registration Phase 2 is for campers who were on the wait-list last season. Phase 2 began on December 15, 2018 at 7:00AM (EST). Multiple Session Registration Policy: Campers may only register for one session at one camp prior to February 1. On February 1, already registered campers may register for a second session at the same or other camp where spaces are available. 1. We do not accept registrations for partial sessions. For program and community reasons, it is disruptive for campers to arrive late or leave early. Please review your schedule before registering and plan for your son to attend the full 2 week session. 2. The only change the registration system for 2019 is the inclusion of Deerfoot Blue Ridge as a registration option. This will appear on the “select session” page of the application (see the 5:10 mark of this video). Simply choose the session labeled for the camp you want to register at. 3. 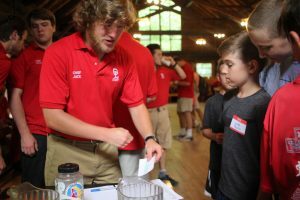 Father-Son Registration will not be part of your initial camper registration. 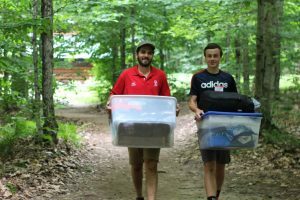 Once you have completed your camper registration you may register for Father-Son separately. This registration form will appear on your CampInTouch page in the “Forms and Documents” section. 4. With CampMinder, all your Deerfoot paperwork will now be in one place! All forms related to your son’s time at camp will be done through CampInTouch. This will include health forms and all other camp-related forms. Click HERE for a guide to forms on CampInTouch. 5. CampInTouch will also give you access to your Deerfoot account, where you can see any balance due, payment history, etc. You can also make payments online through CampInTouch. If you have questions regarding this system, or about Deerfoot in general, please feel free to contact Chief Craig (chiefcraig@deerfoot.org). Click here to access your CampInTouch account and the Camper Application (look for the green, tree-icon button as pictured to the right). Don’t have a CampInTouch account yet? Click here to set one up, and then begin the camper application.